I tell you what, if you haven’t downloaded Google Earth by now, you are missing out, not only are they getting ready to release a new version, they also have layers, a great way for others to add content to Google Earth, just like these great new Geographic layers Google released with location-specific Wikipedia content, Panoramio photos, and community comments. Click here for a screenshot. Click this link to download Google Earth, it’s part of the Google Pack, you get to pick what you want, so if you just want Google Earth, you can download just Google Earth! The new Geographic Web layer we released today is one of those features. 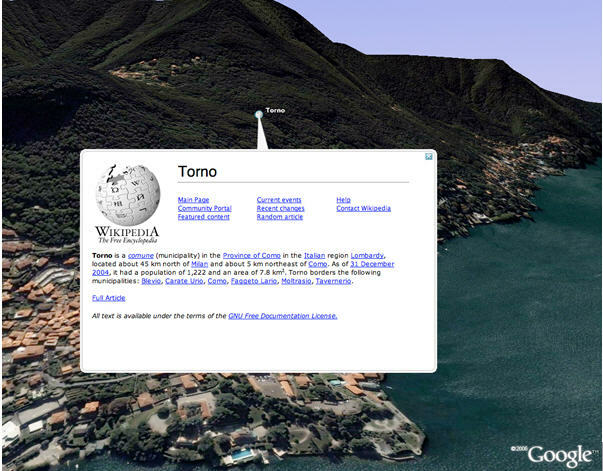 We’ve taken the rich data of Wikipedia, Panoramio, and the Google Earth Community and made a browsable layer in Google Earth. Now you can fly anywhere in the world and see what people have written about it, photographed, or posted. I went hopping around from the southern tip of South America to the mosques in the Middle East to the Maldives Islands, immersed in a wealth of information, and I really felt like I was visiting each place through eyes of people who had been there. It was really engaging to compare, say, the Grand Canyon through the photos in Panoramio to the view from Google Earth, where I could follow the Colorado River through each. I will be posting more links to great Google Earth Layers shortly.